Zentangle Challenge 174 - Minette Riordan, Ph.D. I love the weekly Zentangle challenge from IamtheDivaCZT. This week’s challenge was about combining strings and was shared by Aimee Belair, CZT from Inkerbelle.com. Following some of her examples, I chose to combine a round string with a triangle in the center. It’s not a usual Zendala for me, I normally like more organized/equal patterns in the mandala tradition. 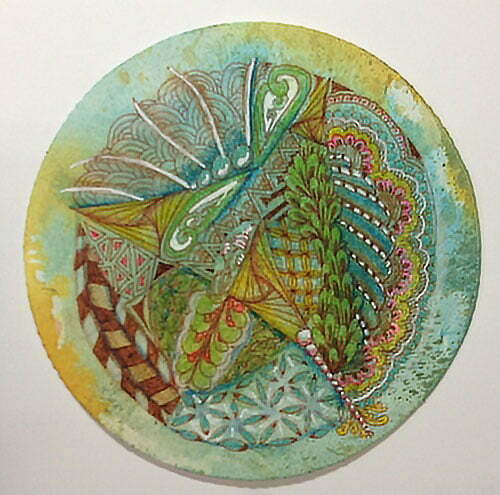 But I had already painted the background of this blank Zendala tile and liked the colors. I got the inspiration from Bonnie McLain in a conversation we had about her beautiful contribution to last week’s Zentangle challenge. You can see her work here. I used Ranger Distress Inks to color the backgrounds. Then I added more color with my Inktense watersoluble pencils and Sakura pens, some Glaze and some Gelly Roll. I also used a brown micron pen to draw the tangle patterns. I had fun experimenting with the mixed media techniques of working on a colored background and then continuing to add layers of color. I like how the triangle in the center of my string is still faintly visible. Can’t wait to see what next week’s Zentangle challenge will bring. Very beautiful, I love the soft coloring. That thud was my jaw hitting my desk! I would like to see an even larger picture to study it more. Thanks, I just snapped a pic with my phone but will take a better one today and repost a larger version. I love the colored background that you used on this tile, so rich. It is beautifully done and I am glad you enjoyed the mixed media. Absolutely gorgeous and unique piece of art! Truly a piece of art. Beautiful! Like the white highlights on this. Really like the background. I love this zendala! Beautiful! The painted background is stunning and really highlights the beauty of your art. Thank you Holly, I appreciate the feedback.